Some unlucky Toyota Prius owners have been finding their hybrid cars distinctly less hybridized over the last few weeks, as thieves have taken to stealing the battery packs from their vehicles. What a surprise to find your Prius battery stolen. Police and Toyota dealerships are becoming aware of the growing trend, in which criminals smash the car’s rear windows before cutting the cables connecting the battery and lifting it free from the trunk. It’s not entirely clear what kickstarted the battery thefts, but Yahoo Autos speculates the demand for the tech might be rising because first-generation Prius’s, bought around a decade ago, are nearing the end of their battery lifetime. Replacement Prius batteries from official sources can cost up to $3,000, while second-hand batteries are a literal steal, reportedly going for under $1,000 on Craiglist. The lack of an identification number on hybrid batteries reduces the risk in stealing them. But if the thieves are boosting the batteries to sell to owners of older Toyota hybrids, they must be doing some extra work behind the scenes. 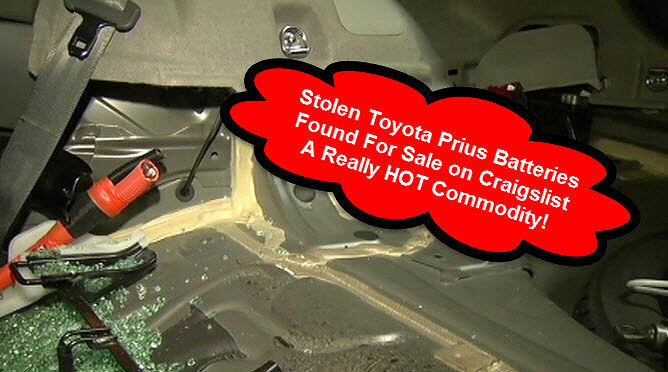 According to Yahoo Autos, most of the stolen tech has come from the newest third-generation Prius, whose battery is not immediately compatible with first-generation models unless its cells are reassembled in a new housing. But stealing one is not like looting a catalytic converter, or replacing wheels with cinder blocks. The battery pack weighs around 120 pounds and could easily electrocute the careless. In these cases, the thieves — who many believe are part of the same group due to similar techniques used to remove the battery — smash the rear windows, cut all the connecting wires (according to one Toyota dealer, the battery does not give off power when the car is off), and rip the battery and its corresponding modules out of the trunk.